The 49ers' newly acquired head coach Kyle Shanahan brings with him an explosive offense that ranked 7th all-time in points per game (tying the 2000 St. Louis Rams "Greatest Show on Turf"). Under my personal favorite metric, Football Outsiders DVOA, the 2016 Falcons offense ranked first overall by a wide margin. DVOA measures efficiency on a per-play basis and the Falcons ranked first in the passing game and seventh in the running game. In a couple of other recent breakdowns for Fansided's Niner Noise, I've examined various aspects of the passing and the running games. Today and in a later post, we'll look at how Kyle Shanahan uses the running game to set up play-action passes. The Falcons were no strangers to big plays, ranking 2nd in the NFL in pass plays over 25 yards and 6th overall with the combined run and pass (big plays in the run game are runs that go for 10+ yards). Now that I've established the Shanahan coaching tree, let's get into some film. The one coach we're going to focus on here is Alex Gibbs, who is widely considered the father of the modern day version of the zone running game. I've covered the inside and outside zone runs under Chip Kelly, but whereas the inside zone was the staple running play of the Chip Kelly offense, the outside zone — or wide zone — is the base running play of Shanahan's offense. While the inside zone seeks to push a defense vertically, the outside zone seeks to move a defense laterally and pin them to the inside. 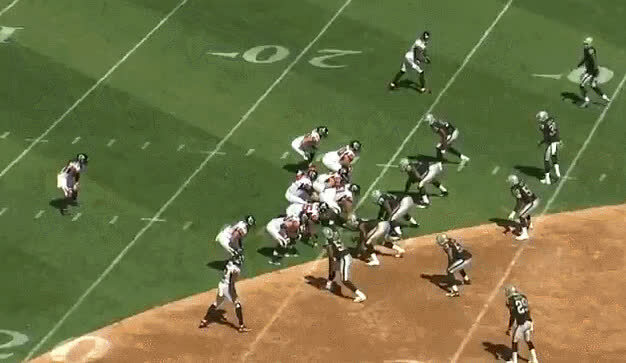 To accomplish this, the linemen will use a blocking technique known as the "rip and run" to either pin defenders inside (rip) or, if they have not reached their defender by the third step, seek to run the defender to the sideline (run). 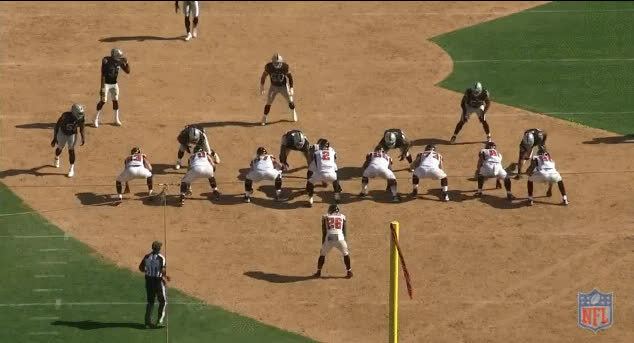 At the snap, the telltale sign of an outside zone run is the kick step to the sideline the offensive line takes. It's here where Gibbs makes perhaps his most important coaching points: by the running back's third step, he should be making his determination on where to cut up field based on where the offensive line is holding its blocks. 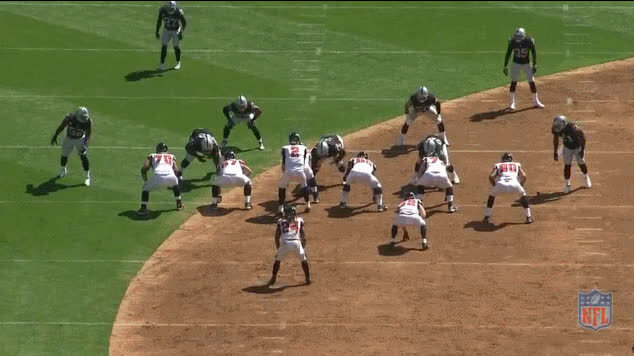 Against the Raiders in week two, the Falcons here are in 21 personnel (two RBs, one TEs, two WRs) in their pre-snap alignment with the strong side of the formation set to the right and the tight end in a wing aligment (important for later). At the snap (above pic), Falcons running back Devonta Freeman takes the handoff and by his third step, he already knows where he's going. The no. 1 EMLOS is outside the landmark and No. 2 is sealed to the inside. After that third step, Gibbs says this is where the running back will begin to act on his read so that on those fourth and fifth steps, he makes that cut. 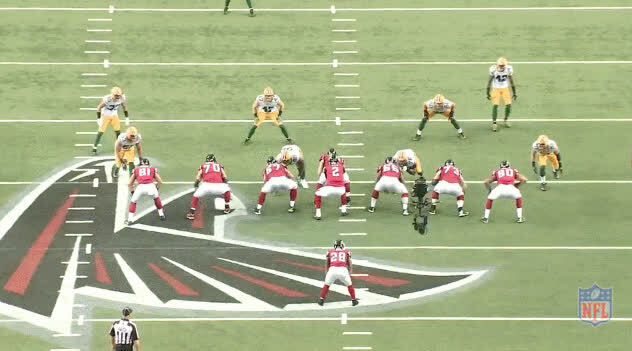 In this case, with the defenders sealed inside, Freeman "bangs" up the middle for a four-yard gain. You can see by the time Freeman gets to his third step, the cut lane is dictated for him. The next two gifs show the "bounce" and "bend" reads. Pay particular attention to the Nos. 1 and 2 defenders on the end of the line of scrimmage, which way they pursue, and where the running back makes his cut. All play-action bootlegs are built around the same principals and are designed to achieve the same goals. Play-action bootleg plays utilize misdirection to confuse defenders, particularly the front seven. They look like running plays, slowing the pass rush and drawing the linebackers close to the line of scrimmage to open passing lanes. The run-action also slows the pass rush, and the movement of the quarterback forces defensive linemen to change their pass-rush angle. Finally, play-action bootlegs usually flood one side of the field with receivers while putting the quarterback in position to execute short, easy throws. All successful play-action passes are built from running plays and Shanahan will use the outside zone to build his play-action passing game. Later against the Raiders, the Falcons come out in 12 personnel (one running back, two tight ends, 2 receivers) with the tight ends again in a wing alignment. The offensive line still technically blocks like they would on the zone run, being careful not to get too far ahead of the line of scrimmage for risk of drawing an illegal man downfield penalty. Shanahan runs the boot-action with 3 levels in the passing progression. The tight end coming across the formation away from the boot leaks into the flat immediately. The play side tight end crashes down and angles out above the #1 to a depth of about 5-6 yards. The third receiver in the progression runs the deep crossing route at a depth of about 10-12 yards, mainly to occupy the safeties. The clearing route, either a streak or a corner route, is the last progression and is basically there to run off the safety. In the above image, the play starts off looking like the outside zone with the offensive line taking their zone steps and the quarterback selling the hard fake to the running back. The receivers all sell their blocking assignments before crossing the field in the opposite direction. 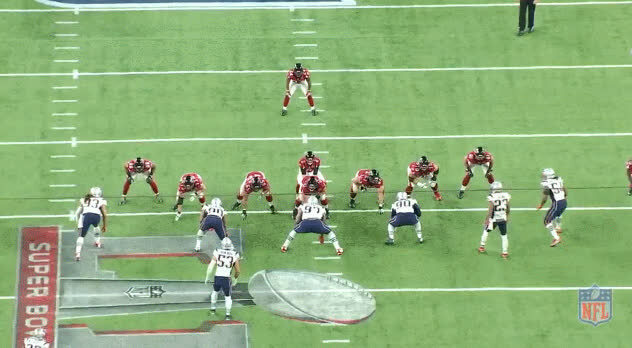 On this play, the safe play is the first tight end in the shallow flat since the outside linebacker pursues the quarterback, leaving the flat wide open for an easy completion. Quarterback Matt Ryan flips it over the defender and the tight end takes it for a 16-yard gain down the sideline. The final play in this set is what is generally know as the outside zone boot play-action with a wheel route on the backside. The play follows a similar pattern as the outside zone and the boot play-action. The play begins by looking like the outside zone with the quarterback faking to the running back before booting out the opposite way like the regular bootleg play covered earlier. The backside tight end runs the crossing route between 5-8 yards while the backside receiver runs the deep post route. The concept is designed to pull the coverage to the roll-out side of the play while the strong side tight end blocks down before releasing down the field in the opposite direction on the wheel route. In the next installment of this two part series, we'll look at a different variation of the play-action Shanahan will likely use with the 49ers that will help you identify it when you see it on Sundays. Feel free to let me know if I have missed anything or got anything wrong with the descriptions and leave any comments or questions on here or on Twitter @rjmadrid. All gifs and images courtesy of nfl.com. All stats courtesy of Pro Football Reference unless otherwise indicated. Comment: Good stuff, Rich! Looking forward to your take on the drop back PA passing game! Comment: Nice article! Thanks for explaining! Comment: Really nice work. I like how Shanahan often executes this type of playaction with the QB under center. The entire playaction sequence is a near second, a much longer duration than playaction from shotgun/pistol. Couple that with how outside zone blocking gives defenders a difficult high/low hat read compared to most gap blocking concepts, and it makes the outside zone playaction the type that causes the most uncertainty in defenders. Comment: This is the kind of reads that I want to see here. Thanks Richard. Now we must get a good QB to execute all that stuff.